In the U.S., pharmacists are a crucial link in the health care supply chain. Beyond dispensing prescription medication, pharmacists have the academic training to conduct health and wellness screenings and to provide some preventative care as well as advice on healthy lifestyles. Empowering pharmacists by changing the laws governing their practice would enable them to take a greater role in tackling the challenges associated with an aging society and the prevalence of chronic illnesses, which could have long-reaching benefits for both government and society. In this article, we explore the role of pharmacists in health care and the opportunities that could be unleashed if legal restrictions on what services pharmacists can provide were to be changed. Such restrictions vary by state: In some states, pharmacists are prohibited from prescribing drugs for conditions that do not necessarily warrant a physician’s consultation; in other states, pharmacists are now allowed to provide vaccination shots. We begin with the good news about pharmacists: They are highly accessible, they see high usage rates, and they are trusted by consumers. The U.S. is home to roughly one pharmacist for every 1,000 citizens, making pharmacists a highly accessible channel for health care. In 2014, there were more than 297,000 pharmacists in the U.S., and that number is expected to grow by 3% by 2024, according to the Bureau of Labor Statistics. Data from the Drug Channels Institute indicate that most pharmacists work at pharmacies located in drug stores, mass merchandise stores and supermarkets. Fully 69% of U.S. consumers visit a pharmacy at least once a month, according to a public opinion poll conducted by CVS Health in February 2017. Of those surveyed, 59% indicated that they ask pharmacists questions “often” or “sometimes,” and most of these questions were about medication side effects, the correct use of prescription medication and medication interactions. Pharmacists are a highly trusted source of health care advice. More than a quarter of consumers polled by CVS indicated that they had made or changed a health care decision based on a conversation with a pharmacist. In fact, the influence of pharmacists’ advice regarding health and wellness is growing, while the influence of advice from other sources is declining or growing more slowly, according to research from Aon Hewitt and the National Business Group on Health. Nevertheless, pharmacists are still playing catch-up in the influence stakes, compared with doctors and nurses, as shown above. • Looming primary care shortfall — A critical issue in the health care system is the impending scarcity of primary care providers. The Association of American Colleges and Universities estimates that the U.S. will see a shortage of 91,000 physicians by 2020, split evenly between primary care physicians and specialists. The above-mentioned CVS poll provided insights on consumer-pharmacist interactions that suggest pharmacists could, in some instances, become primary care providers. More than one-third of survey respondents indicated that they choose to go to pharmacies for preventive health screenings, physicals and vaccinations. And fully 70% of respondents indicated that their choice was based on convenience; meanwhile, some 42% cited accessibility and 32% cited cost as reasons for choosing pharmacies. Equipping pharmacists to provide other health care services could help address the health care shortfall and ease the burden on existing primary care providers. • An aging population and a growing number of chronically ill patients drive up health care costs — While the number of primary care providers is declining, the number of those in need of primary care is on the rise, creating a significant gap between supply and demand and, so, driving up costs. According to projections from the United Nations, people age 65 and older in the U.S. will grow from representing 15% of the total population in 2015 to 21% in 2030. The growth of the aging population is principally being driven by people living longer, so the population of those age 75 and older, or “older seniors,” will grow even faster than the total senior population. And that means a substantially high number of seniors living with health impediments. Some 36% of Americans age 65 and over, or approximately 15.5 million people, reported experiencing some kind of disability in 2014, according to the latest available American Community Survey conducted by the U.S. Census Bureau. But it is not just senior consumers making demands on the health care system. Younger people with chronic conditions, such as those with diabetes, are adding pressure, too. The Centers for Disease Control and Prevention (CDC) indicated that, as of 2012 (latest available data), about half of all U.S. adults, or 117 million people, had one or more chronic health conditions. Fully 86% of health care spending in the U.S. in 2010 was for people with one or more chronic health conditions, according to the agency. A study led by Dr. Timothy Wilt, staff physician at the Minneapolis VA Health Care System and professor of medicine at the University of Minnesota School of Medicine, confirmed that pharmacists can help in effectively managing the care of people with chronic ailments. Dr. Wilt’s study of 33,000 patients found that patients receiving pharmacist-led care were more likely to reach target goals for cholesterol, blood sugar and blood pressure levels than those who receive care from the usual health care providers. Dr. Wilt argued that having pharmacists manage the routine care of chronically ill patients would allow doctors to tend to people with more serious health problems. As pharmacists are paid less than doctors, this could result in considerable savings in terms of spending on health care, he added. • Growing Millennial interest in health and wellness — At the other end of the scale from seniors, those in younger age groups exhibit particular interest in wellness. The concerns of Millennials — characterized as those born between 1980 and 2000 — vary; many in this age group seek to achieve an optimal level of health and well-being, while others prioritize safeguarding against illness in order to accommodate their “live more” mentality. This demand for wellness is reflected in health care participation by age, as shown by the figure on this page. 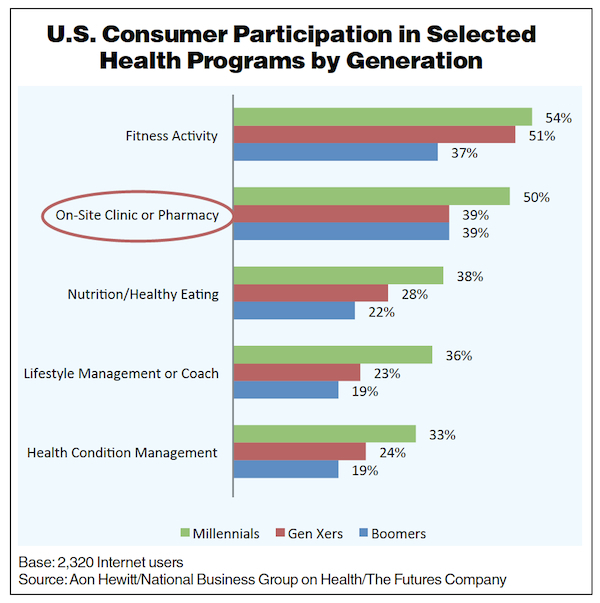 A higher proportion of Millennials participate in health programs at on-site clinics or pharmacies than members of older generations. • Pharmacists are not recognized as providers of health care across the country — In the U.S., pharmacy practice is governed by federal laws as well as by state laws. As pharmacists are not yet recognized as providers of health care across the board, their knowledge and skill remain underutilized. One remedy is to obtain provider status, but the process for doing so is multilayered and complicated. Pharmacists are excluded from sections of the Social Security Act, which is a federal act designed to provide for the general welfare through a system of benefits. These sections dictate pharmacists’ eligibility for compensation under public health care plans, such as Medicare Part B. State and private health care plans refer to this as a reason they exclude pharmacists from allowances, thus narrowing the care that pharmacists provide. • Pharmacy laws and statutes vary by state, and some state laws are restrictive — This makes identifying a comprehensive resolution challenging. For example, some state health plans exclude pharmacists from compensation although they are allowed to counsel patients, while others prohibit pharmacists from performing tasks beyond dispensing prescription medications and educating patients on their use. Patients in Oregon and California can obtain contraceptives from a pharmacist after getting their blood pressure checked and filling out a questionnaire, but in other states, where pharmacists do not have prescriptive authority, patients must meet a physician in order to secure a prescription for ­contraceptives. • Conflicts exist between federal and state laws — Having both federal and state laws governing pharmacy practices complicates things further. Where there is a federal law and a state law for a single issue, the stricter one prevails. • Pharmacists are paid based on prescriptions filled and not for other activities — In many cases, pharmacists are paid based on the number of prescriptions filled and not for the other tasks that they are capable of performing. Even Medicare covers only the dispensing of prescription medication; it does not include the other services that pharmacists extend to patients. In a number of states, therefore, empowering pharmacists to become health care providers would require a change in legislation governing pharmacy practice. Over the last few years, the movement to confer provider status on pharmacists has been gaining traction. The Pharmacists Provide Care campaign has been a particularly strong voice in advocating for the change, and it is educating pharmacy students, members of the House of Representatives and others to push for legislation that will grant better recognition to pharmacists as health care providers. A bill called the Pharmacy and Medically Underserved Areas Enhancement Act, first introduced in the previous session of Congress, calls for amending a section of the Social Security Act to cover pharmacist services under the Medicare program. If passed, the legislation would allow pharmacists to deliver care to patients in federally defined medically underserved areas. The bill had garnered support from 296 sponsors (nearly 68% of the House), but did not make it through the entire legislative process in the previous congressional cycle. It was reintroduced in the current session on January 20, with the support of 107 House members or cosponsors, and has the support of 146 representatives (33.5% of the House) as of March 28. There are three stages it needs to clear before it becomes a law, and it is currently in the first stage, being reviewed by various committees before it is passed to the House for debate. There is a similar bill in the Senate, which was introduced on January 12 with the support of 26 cosponsors. It is currently up to 33 (33% of the Senate). Over the last five sessions of Congress, more than 10,000 bills were introduced each cycle and only about 3% became laws during that time. So, the chances of reform are slim. Empowering pharmacists to go beyond drug therapy management would allow optimal use of their expertise and skills, and help address the strain on the health care system posed by a growing aging population and a growing number of chronically ill patients. As we have noted, American pharmacists are accessible, highly used and trusted by consumers. In a rising-cost environment, there are opportunities for pharmacists to take a more prominent role in primary care. But in a number of regions, legal restrictions remain a challenge. As chain and independent drug stores and retailers with pharmacies employ a majority of the pharmacy workforce, we could see them become drivers of change to empower pharmacists to expand beyond their current roles. 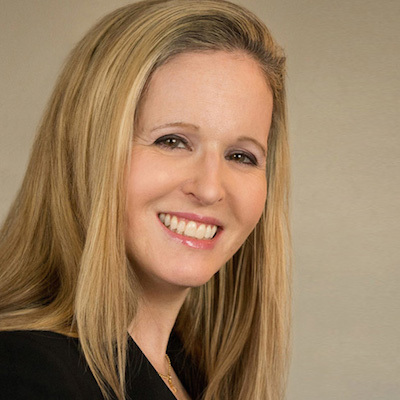 Deborah Weinswig, CPA, is managing director of Fung Global Retail & Technology. She can contacted at DeborahWeinswig@fung1937.com.